When I was in 5th grade, I had a soccer ball hit me in the nose. More specifically, my brother kicked a soccer ball into my face. Since then, my smell has not been the same and I can handle much more spice. I think this is due to the fact that 80% of taste comes from smell. Because, I can not smell very well either, everything tastes very bland, kind of like I have a cold. I enjoy more spicy foods than I used to and I think this is because they are bolder and I can smell them better. 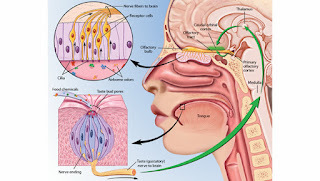 Attached is a picture explaining the close connections in the two sensory origins in your brain. 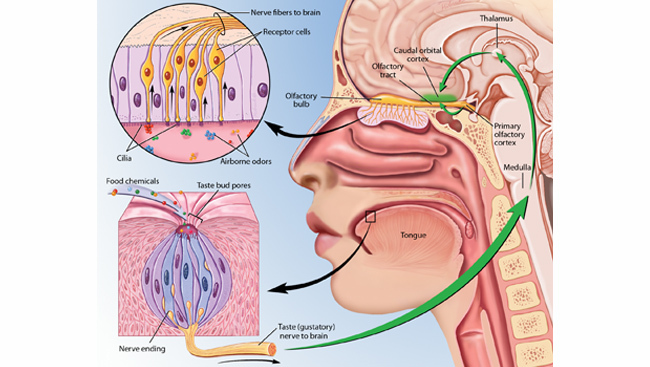 Hearing from someone who is actually experiencing a taste of anosmia (no pun intended) is actually really interesting. I found this topic to be eye opening when reading about Karl's story. Being someone who loves to cook and use many different flavors, I could not image what you have/are continuing to go through. When you said "everything tastes very bland, kind of like I have a cold", you really painted the picture for me. Not being able to taste something is the worst thing about having a cold. For me, it is also how my body warns my brain that I am starting to get sick. Thank you for sharing your experience.